The top leaders of the National Catholic Committee on Scouting have made an uneasy peace with the Boy Scouts of America's decision on July 27 to allow openly gay troop leaders and employees to serve in their ranks at the national level. The Boy Scouts' decision does not affect decisions about leaders made by local troops and councils and also permits religiously chartered Scout troops to choose leaders whose values are consistent with those of the sponsoring faith. "It is not entirely clear how these rights will be squared with previous policy changes the Boy Scouts have made ... but it appears that the resolution respects the needs of Catholic-chartered organizations in the right to choose leaders whose character and conduct are consistent with those of Catholic teaching," said a July 27 statement from Edward Martin, national chairman, and Father Michael Hanifin, national chaplain, for the National Catholic Committee on Scouting. "At the same time, we express strong concern about the practical implications of this resolution, especially for our young people in Scouting, and whether the term 'sexual orientation' will be correctly understood and applied only in reference to sexual inclination and not to sexual conduct or behavior," they said. "The resolution also affirms a chartered organization's right to select its unit leaders based on its religious principles, rejects any interference with that right, and provides that local Scout councils will not interfere with chartered organizations' rights in this regard," said a July 28 statement from Bishop Robert E. Guglielmone of Charleston, South Carolina. "As chartering organizations, individual parishes, institutions and Catholic schools have always had this right." In their statement, Martin and Father Hanifin said they also were concerned that the new resolution "articulates a position on adult sexual conduct that does not make clear that sexual behavior should be reserved to a husband and a wife in marriage." "Our youth don't want to leave Scouting. ... Let's continue this important journey together and pray for the future of Scouting!" Martin and Father Hanifin said. The Mormon church, whose troops account for 17 percent of all Boy Scouts, strongly criticized the policy change. "The Church of Jesus Christ of Latter-day Saints is deeply troubled by today's vote," said a July 27 news release. "When the leadership of the church resumes its regular schedule of meetings in August, the century-long association with Scouting will need to be examined." The statement said the church has been examining alternatives, especially for Mormon boys who live in areas without a Boy Scouts presence. The new policy was crafted by the Scouts' top leaders, including Robert Gates, the former defense secretary who is now the Scouts' president. According to the Scouts, 79 percent of its executive board members on a July 27 conference call approved the new policy. The numbers of Boy Scouts has been slipping in recent years. 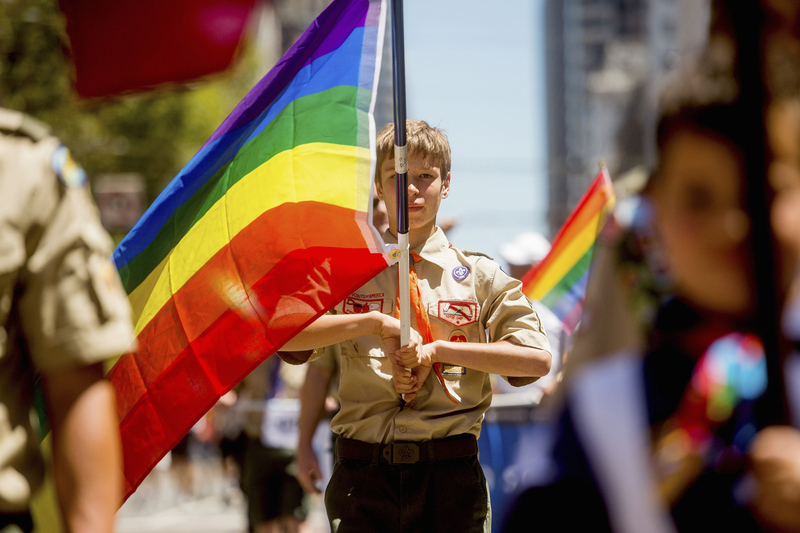 Faced with criticism over the organization's policies toward gays, as well as lawsuits against the Boy Scouts and declining business support, the Scouts allowed openly gay youths to join in 2013. Membership dropped 6 percent that year, and slipped another 7 percent last year to 2.4 million. The drop was attributed to departures by some evangelical churches over the 2013 policy change. When a Boy Scouts committee unanimously recommended July 13 that the ban on gay troop leaders and employees be rescinded, the Southern Baptist Convention looked askance at the move. Russell Moore, president of the denomination's Ethics &amp; Religious Liberty Commission, predicted an even greater exodus of Baptists from the Scouts, and expressed skepticism the Scouts would hold the line on protecting the rights of churches and other religious institutions. "At every point, the Scout leadership tells us that they will go this far and no farther, but here we are again -- so it's hard for me to believe, in the long term, that the Boy Scouts will allow religious groups to have the freedom to choose their own leaders," Moore told Baptist Press July 14. "In recent years I have seen a definite cooling on the part of Baptist churches toward the Scouts. This will probably bring that cooling to a freeze."